I have to say, an embassy community knows how to party. We have never had so many holiday events to attend! It surely helps when Christmas isn't happening all around you: no decorations in stores, no Christmas music on the radio, and definitely not Christmas-y weather. Anyhow, we have been busy little bees (or elves?) and even decided to let J out of the house since after all, it is Christmas. Last Saturday we kicked things off at the Ambassador's Embassy-wide Holiday Party. First off Joe had to introduce G to the Ambassador's new puppy: Sonny Boy. No one should be surprised that G went straight for the lips. This is G's first ever meeting with Santa. Santa gives each child a gift at the party (bought and pre-wrapped by Mom beforehand) You can tell this by the difference in the gift G is given and the beautifully wrapped gift the next child is getting. Santa was not a success. J is shown here flirting with my friend Pam. Pam and I, both Texans, take French together, so there is a whole lot of Spanish/French vocab. and accent mix-ups. It's quite comical. Si? Oui! Mom was in town and able to join us. 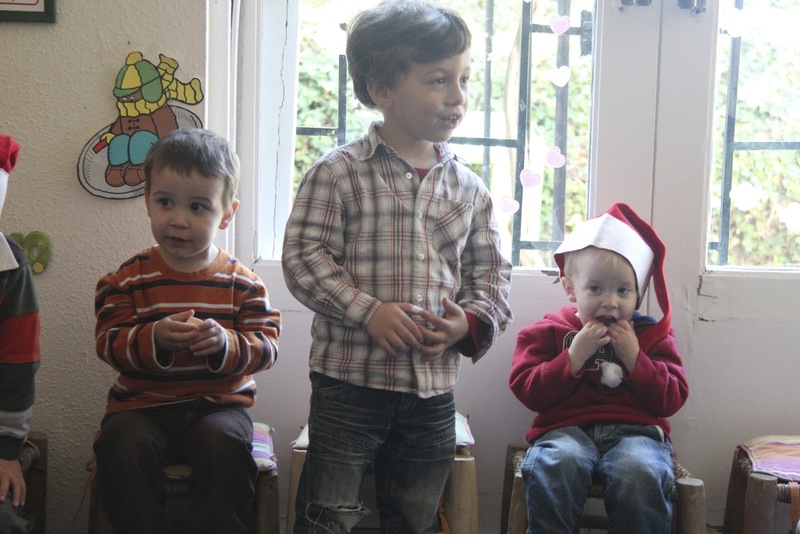 Later this week G's preschool class had a short program and party for Christmas. As a teacher that has put on many of these productions, I was pretty thrilled to be on the other side of things. And of course, now I understand the cuteness of watching your child and the PRIDE. Oh, the pride. Even if he didn't actually do much singing or the movements, by golly, he kept his santa hat on and stayed in his chair for the most part where he was supposed to be (i.e. didn't get into any wrestling matches in the middle of the floor DURING THE PROGRAM, run over and jump off a couch, start digging through teacher materials...behavior expectations are a tad different between cultures). G and his friend, D, are the only Americans in the pre-school and they are the youngest as well. I should also mention that G couldn't sing during most of the program because he had a huge cookie in his mouth that he surreptitiously got a hold of from the party table before the program could begin. Of course. 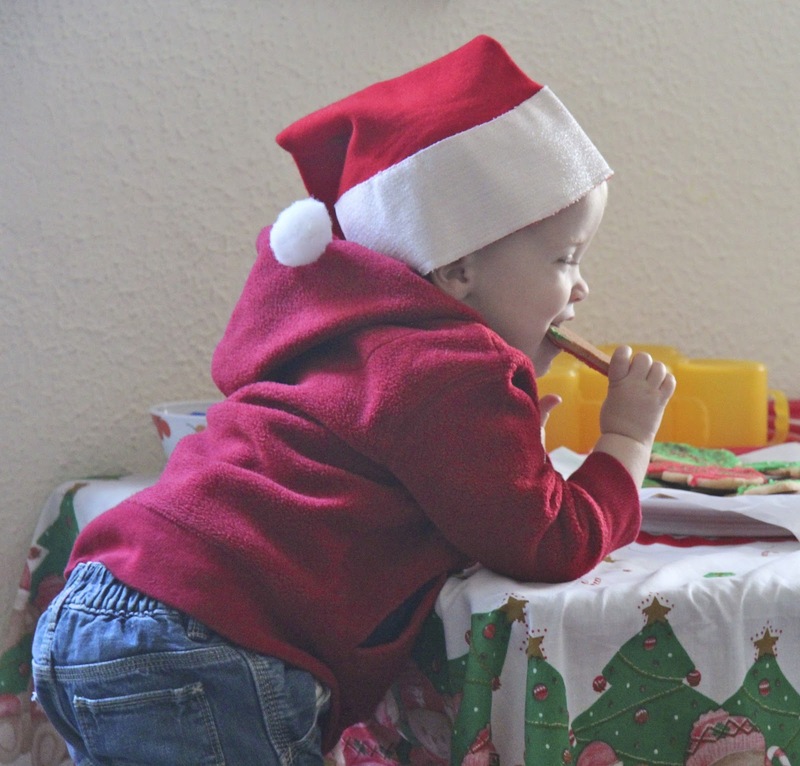 My girlfriend snapped a pic of the actual cookie-sneaking. His class. They range in ages from 2-5. 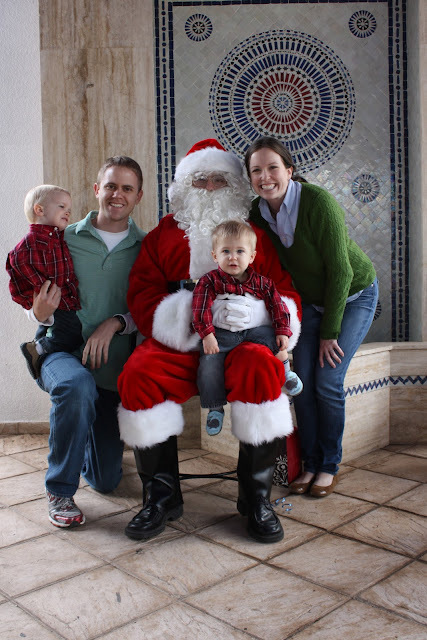 Then, on Saturday morning, the American club hosted a "Breakfast with Santa". Thankfully, Santa didn't show up until most of the kids had eaten. My friend Jamie and I, the only Southerners (and Aggies!) with young kids had ours dressed in matching outfits. Because nothing says Christmas Spirit and the Savior's birth like overpriced holiday duds. It just blessed my little heart. G and Joe spent most of their time at the swings. I think it went even worse this time between G and Santa. J thought he was great!